Between the 60s-70s, rich countries grew by 3.2% per year. During this period, they comfortably used protectionist policies like high tariffs, subsidies, and so on. When they implemented neoliberal policies (free trade), they grew by 2.1% per year. “Growth failure has been particularly noticeable in Latin American and Africa, where neo-liberal programs were implemented more thoroughly than in Asia.” In the 1960s and 1970s, Latin America’s per capita income grew at 3.1% per year. In the 1990s, it grew at only 1.7% per year; between 2000 and 2005, it grew only 0.6%. “Britain’s average tariff on manufacturing imports was 45-55%, compared to 6-8% in the Low Countries, 8-12% in Germany and Switzerland, and around 20% in France. Britain also banned exports from its colonies that competed with its own products, home and abroad. It banned cotton textile imports from India, which were then superior to the British ones. In 1699 it banned the export of woolen cloth from its colonies to other countries (the Wool Act), destroying the Irish woolen industry and stifling the emergence of woolen manufacture in America. Even during its free-trade period, the US “promoted key industries through public funding of R&D. Between the 1950s and the mid-1990s, US federal government funding accounted for 50-70% of the country’s total R&D funding, which is far above the figure of around 20%, found in such ‘government-led’ countries as Japan and Korea.” (Chang, 55-6) Despite its penchant for preaching the religious virtues of free trade, the US practiced virtually every protectionist policy in the book to grow its economy. India’s recent economic success is often attributed to free trade in the early 1990s. However, recent research demonstrates that India’s growth acceleration really began in the 1980s. Furthermore, even after the early 1990s free trade period, India’s average manufacturing tariffs remained above 30%. Contrary to neo-liberal dogma, this did not prevent foreign countries from investing in a highly lucrative market called China. Free Trade disproportionately harms developing countries despite the orthodoxy’s moralizing tales about the miracles of free trade. For example, Mexico’s per capita income growth stood at an average of 3.1% per year during its protectionist period from 1955-82. Compared to its free trade period, during which the US’s subsidized corn destroyed Mexico’s agriculture sector, NAFTA did positively impact the economy. However, the growth of per capita income of 1.8% still pales in comparison to its protectionist period. Moreover, recently NAFTA’s positive impacts seem to have declined as growth of per capita income stands at 0.3%. (Chang, 68) The benefits of free trade are short-lived, and these countries need a long-term goal that allows them to build their infant industries. The Ivory Coast cut tariff by 40% in 1986 due to pressure from free-trade zealots. Its chemical, textile, shoe, and automobile industries virtually collapsed. Unemployment soared. Zimbabwe’s trade liberalization in 1990 increased unemployment to 20%. Pressures from the IMF for rapid trade liberalization reduces the budget of poor nations, and less revenue means cutting education, health, and infrastructure — damaging long-term growth. There is a myth that plagues many people across the world. It is the myth that private enterprises are necessarily more efficient than state owned enterprises. They treat this as a logical tautology. The truth, like always, is much more nuanced and complicated. Austria, Finland, France, Norway, and Italy benefited greatly from SOE’s after the Second World War as well. “In Finland, public enterprises led technological modernization in forestry, mining, steel, transport equipment, paper machinery and chemical industries.” (Chang, 111) France’s famous enterprises like Renault (automobiles), Alcatel (telecommunications equipment), St Gobain (glass and other building materials), Usinor (steel; merged into Arcelor, which is now part of Arcelor-Mittal, the biggest steel-maker in the world), Thomson (electronics), Thales (defence electronics), Elf Aquitane (oil and gas), Rhone-Poulenc (pharmaceuticals; merged with the German company Hoechst to form Aventis, which is no part of Sanofi-Aventis), all used to be SOEs. The common criticism of SOE’s is that there exists no incentive for citizens to monitor them — because they all share the profit. They are secure, with no threat of bankruptcy. This allows them to act as if their budgets are soft. (Chang, 105-6) However, many of the same problems apply to large private firms. Shareholders only own a small amount, so there is also no big incentive to monitor. Their budget is just as soft: the 2008 financial crisis. (107) Considering the success of SOE’s, the dogmatic privileging of private enterprises over SOE’s appears to be totally unwarranted. Most developing countries cannot reap the benefits of patent laws, because they do not have the resources or the infrastructure to conduct researches. Considering the fact that “The World Bank estimates that, following the TRIPS agreement, the increase in technology license payments alone will cost developing countries an extra $45 billion a year, which is nearly half of foreign aid given by rich countries ($93 billion a year in 2004-5), this does not sound like a great deal for developing nations. 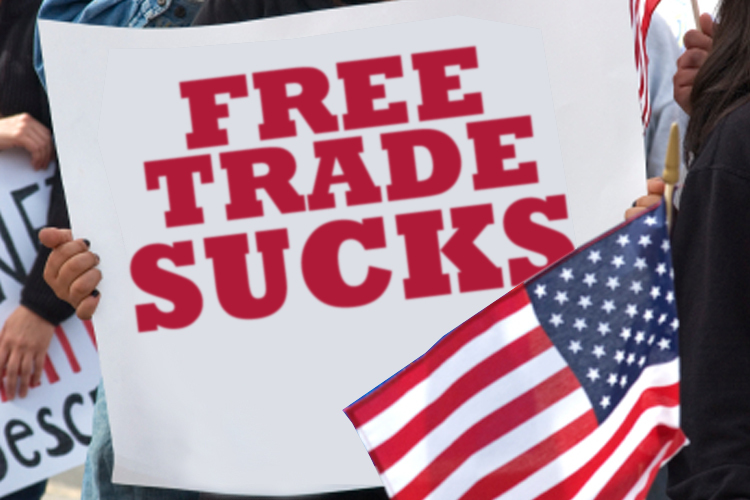 Who Benefits from Free Trade? In 2002, India paid more tariffs to the US than Britain, despite the fact that the size of its economy is only one third of UK. Bangladesh paid as much to the US as France, despite it being 3% the size of France. (Chang, 75) Rich countries account for 80% of the world’s output, conduct 70% of international trade, and make 70-90% of all foreign direct investments. Plus, rich countries own 97% of patents and the vast majority of copyrights and trademarks. Rich countries collectively control 60% of the IMF and World Bank’s voting shares, bestowing them absolute control— for example, the US has a de facto veto regarding decisions in the 18 most important areas. Furthermore, South Korea’s tariff rate was up to 20% -17.4% during its economic miracle period in the 1960s and 19.8% in the 1970s. This doesn’t mean that hyperinflation that we see in Argentina in the 1980s and 1990s, in which actual inflation was 20,266%, is good. It is rather that one does not need to have 1-3% to grow the economy. In fact, two World Bank economists, Michael Bruno, once the chief economist, and William Easterly, show that, below 40%, there is no systematic correlation between a country’s inflation rate and its growth rate. The damage from these policies, therefore, cannot be unique to Brazil. For example, South Africa’s economic growth slowed down thanks to pressure from the IMF — which made it lower inflation rate to 6.3% a year, as investment rates fell from the historic 20-25% down to about 15%. Perhaps, this is why during the latter half of the ‘Golden Age of Capitalism’ (1950-73), the average real interest rates were 2.6% in Germany, 1.8% in France, 1.5% in the USA, 1.4% in Sweden and -1.0% in Switzerland. They knew that they needed lax monetary policies to generate income and jobs. On the contrary, South Africa struggled to keep its interest rates high to maintain low interest rates recommended by the IMF. The figures for Germany, Switzerland, and the Low Countries P. Bairoch (1993), Economics and World History — Myths and Paradoxes (Wheatheaf, Brighton), p. 40. Table 3.3. French Figures. See J. Nye (1991), ‘The Myth of Free-Trade Britain and Fortress France: Traiffs and Trade in the Nineteenth Century,’ Journal of Economic History, vol. 51. no. 1. See D. Landes (1998), The Wealth and Poverty of Nations (W.W. Norton & Company, New York), p. 521. O. Frayssé (1994), Lincoln, Land, and Labour, translated by S. Neely from the original French edition published in 1988 by Paris, Publications de la Sorbonne (University of Illinois Press, Urbana and Chicago), p.226, note 46. The Korean income figure is from H. –C. Lee. (1999), Hankook Gyongje Tongsa [Economic History of Korea] (Bup-Moon Sa, Seoul) [in Korean], Appendix Table 1. The Ghanaian figure is from C. Kindleberger (1965), Economic Development (McGraw-Hill, New York), Table 1-1. Lee (1999), Appendix Table 1 (income) and Appendix Table 7 (exports). Mexican per capital income experienced a fall in 2001 (-1.8%), 2002 (-.08%), and 2003 (-0.1%) and grew only by 2.9% in 2994, which was barely enough to bring the income back to the 2001 level. In 2005, it grew at an estimated rate of 1.6%. This means that Mexico’s per capita income at the end of 2005 was 1.7% higher than it was in 2001, which translates into an annual growth rate of around 0.3% over the 2001-5 period. The 2001-2004 figures are from the relevant issues of the World Bank annual report, World Development Report (World Bank, Washington, DC). The 2005 income growth figure (3%) is from J.C. Moreno-Brid & I. Paunovic (2006), ‘Old Wine in New Bottles? – Economic Policymaking in Left-of-center Governments in Latin America,’ Revista – Harvard Review of Latin America, Spring/Summer, 2006, p.47, Table. J. Willner (2003), ‘Privatisation and State Ownership in Finland,’ CESifo Working Paper, no. 1012, August 2003, Ifo Institute for Economic Research, Munich. M. Berne & G Pogorel (2003), ‘Privatisation Experiences in France,’ paper presented at the CESifo Conference on Privatisation Experiences in the EU, Cadenabbia, Italy, November 2003. ‘Strong global patent rules increase the cost of medicines,’ The Financial Times, February 14, 2001. The IPR expenditure is cited in M. Wolf (2004), Why Globalisation Works (Yale University Press, New Haven), p. 217. The foreign aid figure is from the OECD. The output figure is from World Bank (2006). The trade figure is from the WTO (2005), World Trade 2004, ‘Prospects for 2005: Developing countries’ goods trade share surges to 50-year peak’ (Press Release), released on 14 April 2005. The Foreign Direct Investment (FDI) figures are from various issues of UNCTAD World Investment Report. S. Fischer (1996), ‘Maintaining Price Stability,’ Finance and Development, December 1996. A. Singh (1995), ‘How did East Asia grow so fast? — Slow Progress Towards an Analytical Consensus,’ UNCTAD Discussion Paper, no. 97, Table 8, The other statistics in the paragraph are from the IMF database. Calculated from the IMF dataset. T. Harjes & L. Ricci (2005), ‘What Drives Saving in South Africa?’ In M. Nowak & L. Ricci, Post-Apartheid South Africa: The First Ten Years (IMF, Washington, DC), p. 49, figure 4.1.